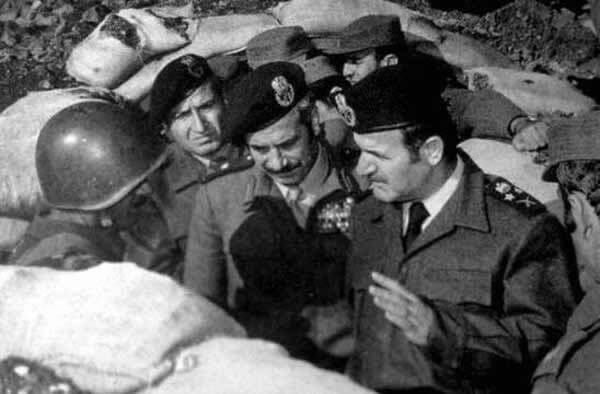 Syria´s president Hafez al-Asad and Defense Minister Mustapha Tlass, during the Arab-Israeli War of 1973, at the Golan front. Wikimedia/The Online Museum of Syrian History. Public domain. Now an almost yearly journalistic exercise, a slew of prominent journalists and analysts are musing about an imminent collapse of the Syrian government in Damascus. While government forces have suffered significant setbacks in the last weeks, such a predicted collapse is not coming. As I said this week on the Scott Horton Show, nationalism in Syria is still alive and well and constitutes the “sticking power” of the Army, whose members do not identify themselves fundamentally according to sectarian or ethnic background, but as Syrians first. The Army understands itself as fighting tooth and nail for the sovereignty of their nation against a foreign invasion by proxy. A failure to understand the nature of the Ba’ath state and the history of the Syrian Army as an enduring and experienced institution with popular backing continues to result in embarrassing and false predictions among politicians and analysts. Kamal Alam’s Pax Syriana: neither vaquished, nor all-conquering remains the best history and analysis of the Syrian Army and why it has not fragmented or collapsed throughout the last four plus years of immense internal and external pressures. OPENDEMOCRACY.NET – The Syrian Army has fought on now for more than three years without disintegrating as had been predicted by many commentators. Indeed it is the Army of the Syrian Arab Republic (al-Jaysh al-’Arabī as-Sūrī) which has kept the state intact. The Syrian state institutions of which the Army is the foremost guarantor have held firm in the onslaught of all the non- state actors as well as regional neighbours. How is it that the Syrian Arab Army has held together? Contrary to what most observers say, the overwhelming factor in this has not been because this was an Allawite army. Had this been the case, it would not have been able to hang on for so long. The most prominent Chiefs of Staff and General Staff officers have been a combination of Sunni, Christian and Allawite. Nor was the army constructed along sectarian or ethnic lines. To take its three major contemporary personalities–Mustafa Tlass, Fahd Jassem Frejj and the late Daoud Rajiha–they are respectively Sunni and Greek Orthodox. The elder Tlass is now retired, but he was the man who shaped the Syrian armed forces with Hafez al Assad in the 1970s.